At Shaw Custom Barrels we offer two types of rifle barrel fluting for you to choose from - Traditional Straight Fluting and Shaw’s Patented Helical Fluting (U.S. Patents DES. 426,611 & USG. 324,780B1). The unique appearance of our Helical Fluting provides the discriminating shooter with a barrel that not only looks great but is up to thirty percent more rigid than a similar barrel with Straight Fluting. 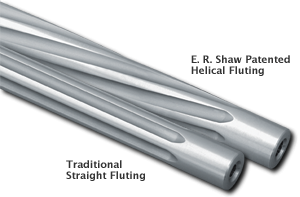 Helical fluting provides additional surface area for improved cooling, improved barrel harmonics, and helps to counteract rotational torque, giving the shooter greater shot consistency.